If you want to be a journalist, there are no holds barred, not in writing, nor thinking, nor anything else. That point was proved in searching for a quote by the late Hunter S. Thompson, with which to begin this article. Most left me howling, all were unprintable here, in a different time. In this time, I had embarked on a journalistic enterprise, taking a blog, The ECOreport and attempting to lift it out of the muck of the blog-o-sphere, “to rake that muck somewhere else.” The story can be placed atop the embers in the place where they burn the books and Boy Scouts sing Kum-ba-ya around the campfire. Corporate Communications and Journalism are two very different things. The later involves lying down in front of the bulldozers of life, and the former, clarifying word choices, and creating “action speech,” so as to eliminate or greatly reduce the capacity for chaos by the human race. Sadly, one thing these two “Kissing Cousins” share is that most corporate communications do not, and similarly, most journalism is not. To investigate more fully, we may identify what the two should have in common, starting with the basics. Journalism has been compromised of late by social media and blogging. I shall not write the thesis here as it has been already written one or two thousand times. Instead I will retreat to the grammarian tendencies of my sixth grade teacher, Mr. Henze, who could be a kindhearted scold. 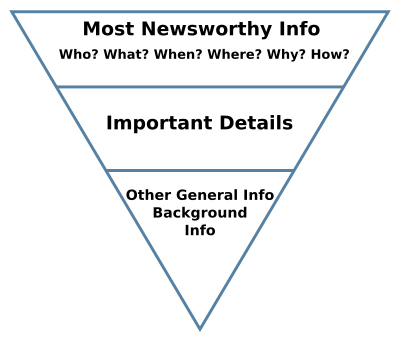 He would want me to tell you that both Corporate Communications and Journalism depend on what is known as the “Inverted Pyramid.” The Inverted Pyramid clarifies information for the reader, or viewer (in a multi-media environment), or for that matter in a campaign. The trick is dealing with complexity. In the days since Dr. Thompson roamed the floor of Caesar’s Palace during the Mint 400, our world has become infinitely more complex. What would the good doctor think if he were then told that one day (today) there would be over 938,000,000 live websites (see http://www.internetlivestats.com/total-number-of-websites/). Whether this statistic indicates there is a lot of “writing”, or simply a lot of data may be a matter of debate. What there is, is a lot of competition for your time, dear reader. Corporate Communications, which most often include web-based elements, must rely on the Inverted Pyramid Style to be able to deliver content that is comprehensible and retain-able, period. Journalism similarly must have a point. If the readers do not get a glimpse of why you are writing the material you expect them to read, you are quite simply, a blogger. The unexamined writing is not worth reading. Recently our team conducted a market research survey on corporate communications strategies and opportunities in non-profit and for-profit sectors. It was found to be most common that writing begins in the middle of the Pyramid, with little introduction to top level facts, then wanders around in there for a while, and ends at the beginning. Secondly, another habit corporate communications will often demonstrate is the use of a website as a “dumping ground.” Even sophisticated organizations populated by Ph.D.s, collect their informational artifacts and seemingly drop them into a website template without considering what journalistic publications have known since the days of LIFE and LOOK, layout. Layout is the hierarchical ordering in a two dimensional space of story elements, vital to understanding the brand and the articulation of the brand. What we care about. How we spend our time, and why it is, you, the customer should care. What Journalism offers Corporate Communications, too, is relevancy, critical judgement, and comparative analysis. All are vital tools for telling a story and saving space (web real estate), while doing it. These are the components of modern narrative.